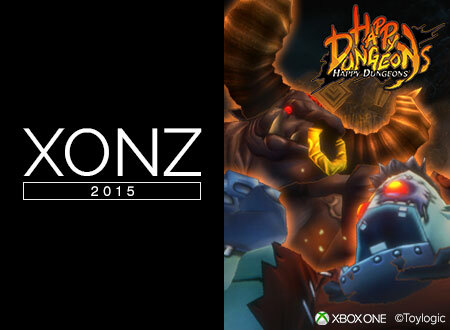 Toylogic Inc. | Toylog - "Happy Dungeons" on Xbox One will be at "XONZ 2015 (New Zealand) on September 26 (Saturday)! "Happy Dungeons" on Xbox One will be at "XONZ 2015 (New Zealand) on September 26 (Saturday)! Toylogic will exhibit at "XONZ 2015 (New Zealand)" hosted by Microsoft! There will be a playable demo for Multiplayer Action RPG 『Happy Dungeons』 planned to be released in 2016 at the event. "Happy Dungeons" is free-to-play Hack & Slash style Action RPG played up to 4 players. There will be a plan to add some linking features with Multiplayer Action "Happy Wars" , so playing both titles will be more fun. Please come by at "XONZ 2015" if you live in New Zealand! 2015/08/05　“Happy Wars” will be delivered on Windows 10! Xbox Live Support Enables Cross Platform Play with Xbox One!! 2015/07/10　"Happy Dungeons" and "Happy Wars" will have a play section at the game event "ChinaJoy 2015 (Shanghai)" and "Ani-Com & GamesHK (Hong Kong)" in China. 2015/06/16　Multiplayer Action RPG "Happy Dungeons" is coming in 2016!